Two weeks from now, the cast of Star Trek TNG will reunite in cartoon form. 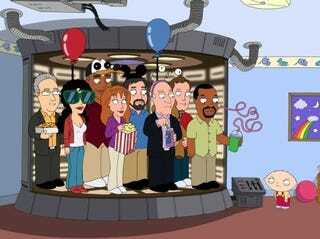 Just about everyone from the cast of TNG is appearing on an upcoming Family Guy episode — take a look! Stewie blows a fuse when he doesn't get a chance to ask his favorite ‘Star Trek: The Next Generation' cast members any questions," reads the logline. "He devises a plan, builds a transporter and beams the entire cast to his bedroom so they can spend a fun-filled day together in Quahog. To see a much larger image of the crew click below.